• Learn from the comfort of your own home and avoid costly travel expenses to Coaching Clinics. • Make sure you and your team come prepared to every tournament so that your athletes can avoid distractions and concentrate on winning more matches. • Learn that hand signals can increase your players winning percentages. • Learn what appropriate on mat behaviors and off mat behaviors are so that you always look like the ultimate professional. • Stay up to date with the current rules and how A class referees are interpreting them. • Know how to create safe environments against child predators and prevent elite athlete abuse. • Supplement your current coaching skills and certifications with Continuing Education. Featuring Sergeant Major E.L.B Mayfield, US Marine Retired, 1996 Atlanta Olympic Sports Information Coordinator, U.S. Armed Forces Coach, CISM Coach, USA Judo Coach/Referee Liaison. Completion of the CDC (Heads Up Course) linked here and SafeSport Course linked here are mandatory in order to receive credit for the International Judo Coach Online Certification. 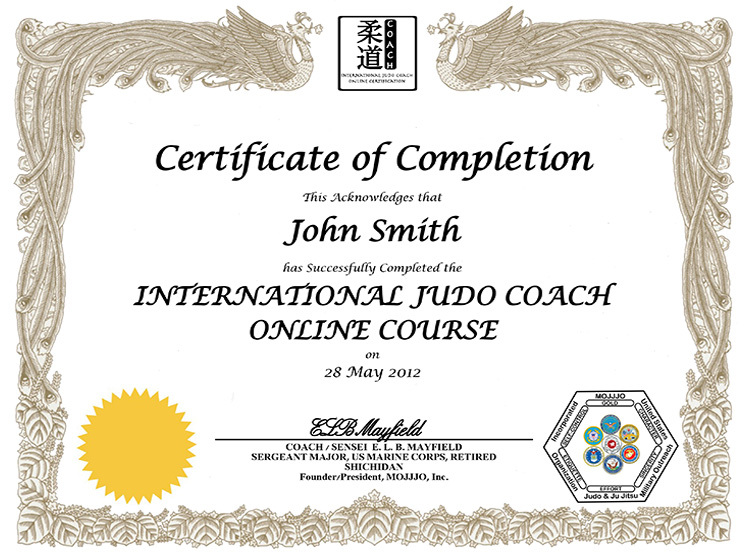 To receive an International Judo Coach Online Certification, check the “I Agree” box below and click the “Buy Now” button.